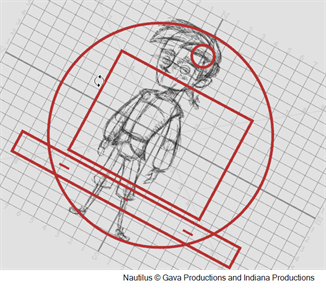 You have the choice to sketch your model as a bitmap or vector drawing. 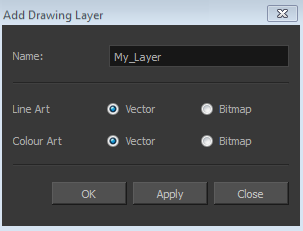 If you like the feel of drawing with bitmap lines, you can set your layer as bitmap. If you like drawing with vectors, you can set your layer as vector. If you use vector, you will be able to enlarge your drawing and zoom into it without losing quality or resolution. You can also use the Contour Editor and Select tools to resize and modify lines. If you draw with bitmap, you will not be able to scale the drawing beyond 100% of its resolution without encountering pixelization issues. 1. In the Timeline view, click the Add Drawing Layer button. 2. In the Name field, name your new layer. 3. 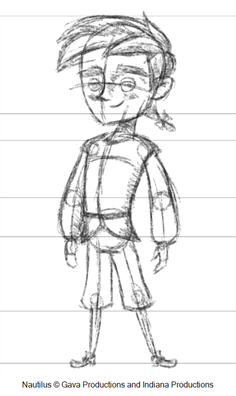 Set the Line Art and Colour Art options to Vector to get a vector layer or to Bitmap to have a bitmap layer. 1. In the Tools toolbar, select the Brush tool or press Alt + B. 2. 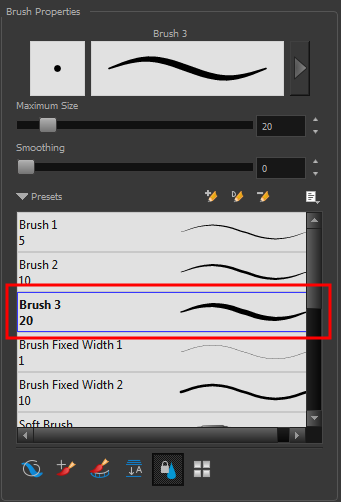 In the Tool Properties view, select a brush preset and adjust its parameters. 3. In the Timeline or Xsheet view, click in the first cell of the drawing layer. 4. In the Drawing or Camera view, enable the Grid (Field Chart). You can press Ctrl + ' (Windows/Linux) or ⌘ + ' (Mac OS X). ‣ Make sure the Drawing or Camera view is the active view while using the keyboard shortcut. 5. 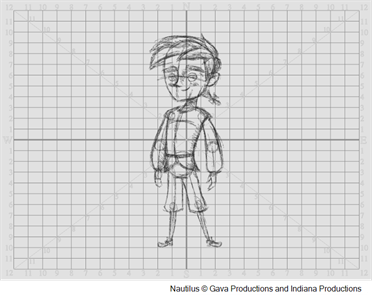 In the Drawing or Camera view, start drawing. 6. To select a different colour, in the Colour view, select a different colour swatch. Double-click on the colour swatch to open the Colour Picker window and modify the colour. Remember that anything already painted with that colour swatch will update to the new colour. 7. In the Camera or Drawing view, use the Rotary Table to rotate your workspace.You can press Ctrl+Alt (Windows/Linux) or Ctrl+⌘ (Mac OS X). ‣ The default keyboard shortcut to reset the workspace rotation is Shift + X. 8. If you decide to draw in the next cell and need to see your previous drawing, enable the Onion Skin by pressing Alt + O.